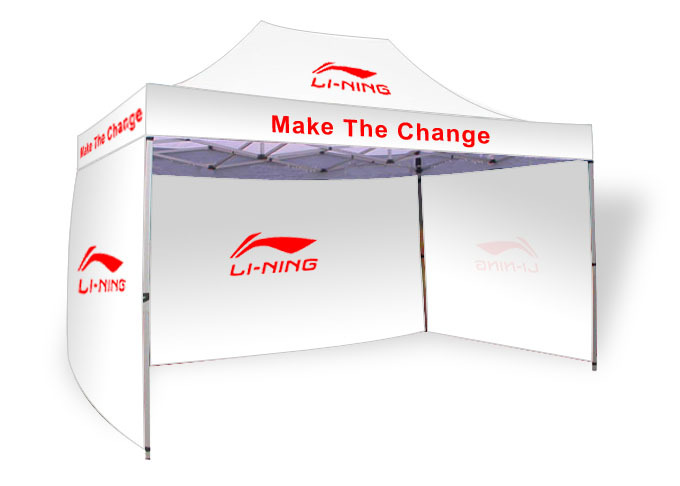 1 Color silkscreen printing of text or logos available on easy-up canopies. Portable display is collapsible and easily sets up in minutes! Easy-up canopies have (4) fabric color options to meet various needs. Ground stakes and sandbags help keep display in place. Compare with tents from a local hardware store. Design Graphic using 1 color. Design Graphic using 2 colors. Design Graphic using 3 colors. 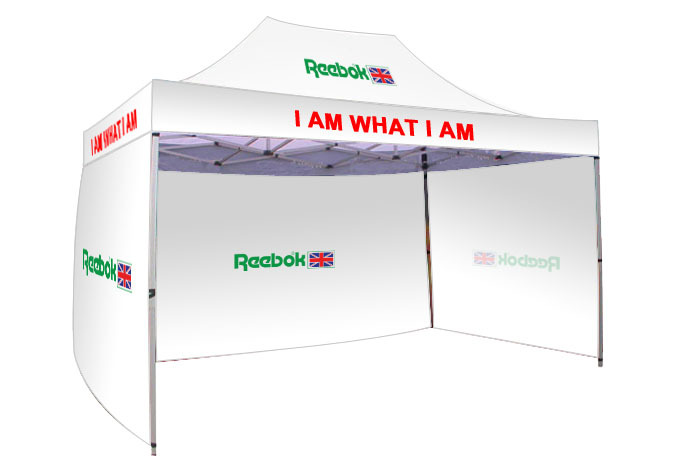 These outdoor easy-up canopies feature 1 color silkscreen printing of your custom text or logo in many places on the tent. The valances of the portable party display have a 90" x 8" design, while the canopy, full wall, and half walls have a 50" x 30" design! The easy-up canopies that have one color printing feature a water-resistant polyester fabric. Designs for your outdoor display can use knockouts to look like 2 colors are used! Party popups, rental gazebos, and other easy-up canopies that provide shade are easy to assemble in minutes with two people. No tools are required, as the cover and walls attach with Velcro® straps, and push-buttons snap the legs and rails into place. 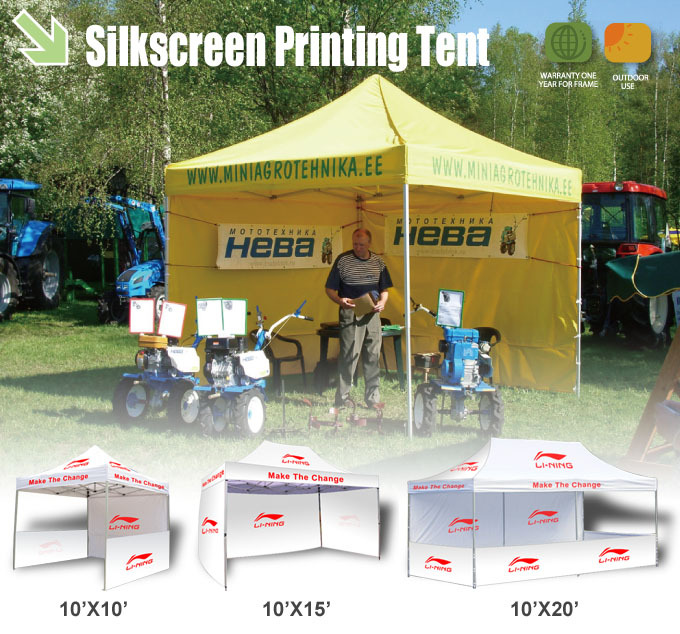 The popup outdoor units, portable easy-up canopies have (3) half-walls and one full wall. This full wall can be folded in half to provide a doorway to the interior! The EZ or easy-up canopies that feature multiple color options have blue, black, white, and red fabric choices. 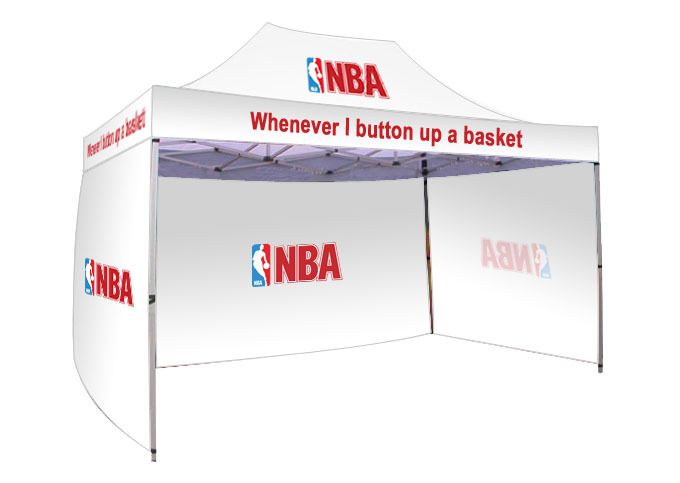 The popup gazebo is 9' 7" x 9' 7" and provides plenty of shade to members of your party or workers at an event. The top of the canopy is raised 11', easily viewed from across a park. The tents include ground stakes and sandbags to help keep the unit in place, unlike some rental displays. If in need of counter space inside the tent, there are folding tables available to the right that are perfectly suited for use inside displays! The included carrying bag holds the aluminum tent frame for transport. Though intended for outdoor use, these displays shouldn't be used during severe weather and/or high winds. Please Note: This display can be used without sidewalls, though overall stability may be affected. It is strongly recommend to use at least two half-walls. Also, backwall includes seam halfway down from top. 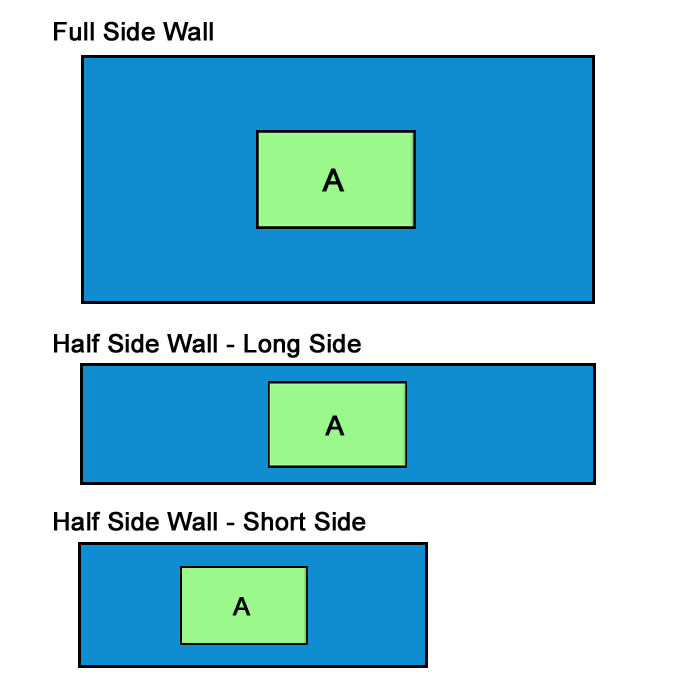 For viewable image and files sizes, see templates below. Design templates (zipped): Download one template for valance graphics, and one for canopy, full and half side wall graphics (two separate templates). Note: Please design only one graphic for template A, and a separate graphic for template B. 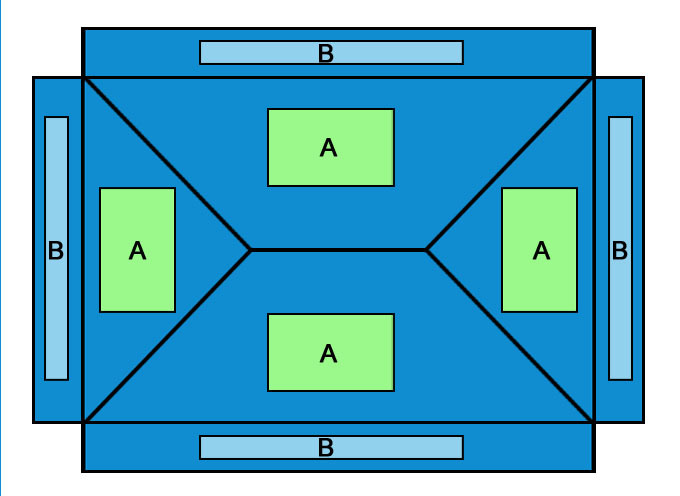 All designated A areas in diagram below will use same A graphic, and all designated B areas will use same B graphic.